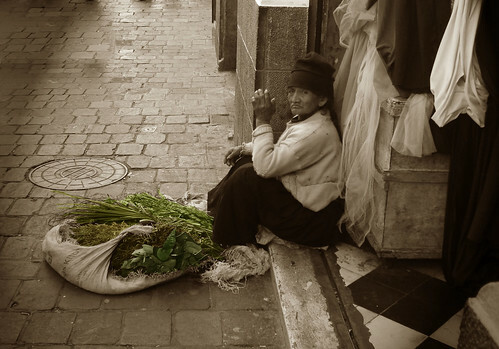 Herbs lady, originally uploaded by ximenacab. 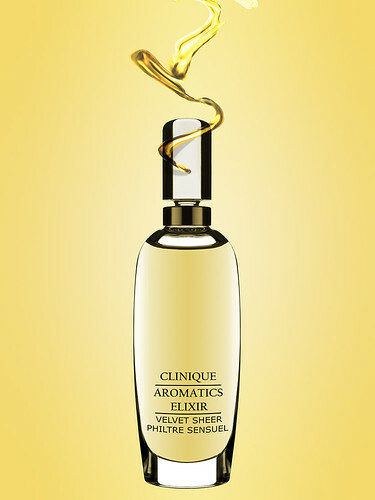 In the past few days, I have been wearing mostly Aromatics Elixir in the "Velvet Sheer" formulation (by the way, I find the name "Aromatics Elixir" odd enough grammatically, so adding the "Velvet Sheer" in the end takes away even from the little sense the name had to begin with). It has a consistency of a shower jel that melts into your skin. It is not alcohol free, but has only very little alcohol in it. And unlike Aromatics Elixir in the pure perfume spray - it has none of the aggressiveness and instead has a powerful but not forceful silage. Instead of being analytical, I would prefer to be descriptive now. Chypres are designed to not give away easily the notes they are composed of. And now this is precisely what I intend to do. In fact, perfumes were not intended to be perceived as individual notes chasing each other on a scent strip or one's skin. Perfume is meant to be greater than the sum of its parts; therefore analyzing perfumes and the notes contained within them could take away from the pleasure of experiencing the perfume as a whole. Aromatics Elixir is indeed aromatic: herbaceously dry and at first even pungent. I will not attempt to compare it to the alcohol parfum formulation as I find that formulation to strong to bear and just never managed to keep it on my skin for long. It's that overwhelming. I think the fact that I've been wearing this slimy velvet sheer liquid for a few days in a row speaks for itself. The dryness of the first few hours does soften in the end and turns into a cozy ambery chypre with obvious vetiver underlining it all. It may not be as polished or chic as the French perfumes of that genre - it is not as seamless as, say, Miss Dior - but I find its direct crudeness to be charming and reassuring in its lack of pretense. The notes do stand out on their own occasionally, as if they didn't have quite enough time to mingle with one another before being bottled, but that just suits me fine. Bodegón copiado, originally uploaded by xuse_22. P.s. I have been particularly enjoying wearing Aromatics Elixir while wearing my pendant filled with Ayalitta solid perfume. The two are not that similar, but their green/aromatic chypre character helps them get along. 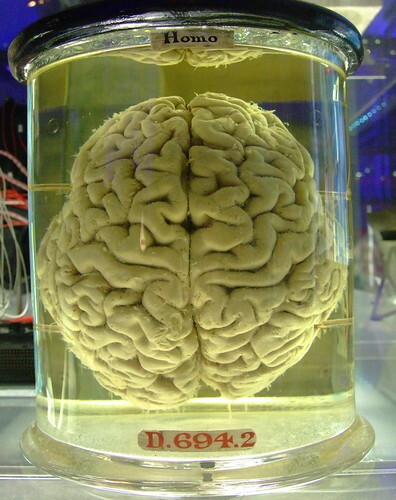 Human brain - please add comment and fav this if you blog with it., originally uploaded by Gaetan Lee. In the past few months, I have been feeling a writer's-resistance for writing about my experiences with perfumes. Blogging about perfumes and "reviewing" them for over 2 years has taught me a lot about perfume. But it also taught me that olfactory fatigue is not just a physical phenomenon; it is actually possible to beat the fun out of something you love by talking about it too much. And this is precisely what I have been trying to avoid recently by not writing perfume reviews for a long time, and instead - enjoying the many other aspects of perfumery, such as perfume creation itself; developing new scented products. My scented candles and sachets for the home have been a pleasure to work on and test and try at my own space; and scenting teas (and chocolates!) added another dimension to my life with quiet, peaceful rituals that I can appreciate alone or with friends. I have spoken last year about a general fatigue that I'm sensing in the perfume world. New launches every day, loads of information online that could eat up a whole day in research, endless perfume blogs (and new ones that emerge quite often too). This abundance is great, but it also has its side effects. "How much perfume knowledge is too much?" asks Angela of Now Smell This. And her question couldn't have been more relevant. I've been asking the same thing myself. While I can't say my knowledge even begins to scrape the surface of what a perfumer should know, the endless amount of perfume-related information that floods our brains is overwhelming. To the point that it might as well beat the fun out of it for some of us. And I'm afraid it has done just that, judging by the number of excellent perfume blogs that have been sitting stale with no blog entry for months and months on end (of course, there could be other reasons for not posting on a blog, but I still think there is a trend here). In the past few months, I have stumbled upon very few new perfume (or new to me) that left with an urge to blog. I haven't even bothered trying any of the many new collections that were released recently (i.e. : Tom Ford's Private Blends). Obviously, I'm just feeling overwhelmed. At the same time, I am enjoying wearing and making perfumes, sipping teas and cooking with aromatic spices and herbs, discovering new flavours I've never tried before, and experimenting with new combination of notes and flavours with much pleasure. Instead of trying a different perfume every day (I've done that over certain periods of my life before) I'm just enjoying a few that I really like, and coming back to old favourites. Instead of feeling pressure to write about whatever is shiny and new, I'm just enjoying the perfumes I already have and love. At the same time, I'm also trying to un-learn my note-desection tendancies, and instead - just enjoy the fragrane as a whole. And nothing could be more appropriate to remedy this analytic disease than a very complex Chypre: chic, sophisticated, earthy, grounding, with subtle nuances and evolution that can never bore even the most experienced nose. Tamya Parfum Formula, originally uploaded by Ayala Moriel. Tomorrow is my daughter Tamya's 12th birthday, aka Bat Mitzvah. Completely spontaneously (I just thought about it this instant), the event will be celebrated on my websites by giving a 12% discount on every purchase of Tamya parfum, and also I will be giving away 12 samples of Tamya parfum for the first 12 readers who will be leaving a comment here; and if I you are not on my mailing list yet, please drop me a line with your mailing address so I can send it to you. Thank you for joining the celebration! P.s. I can't believe I'm a mom for 12 years now! Check out my discontinued Zodiac section on Etsy: Just a few days ago, I've added whichever Zodiac oils I have left as little purse-size roll-ons. Tag, originally uploaded by pixelstate. and Perfume de Rosa Negra - Cristiane Gonçalves’ bilingual perfume blog from Brazil – written in English and Portuguese. 5. Let each person know they’ve been tagged and leave a comment on their blog. 1) Two things I want to do before I die: learn how to ride horses and fly an airplane. 2) My faovuirte colour growing up was yellow. It still is the happiest colour to look at by I prefer wearing beige and more neutral colours. 3) I am vegetarian since birth and no, I don’t eat fish (I always wondered why would be fish considered part of a vegetarian diet?!). 4) My family has been playing ping-pong between Israel and Canada for 4 generations now: My mom was born in Israel & raised in Montreal; I was born in Outremont (Quebec) and raised in Israel; and my daughter was born in Israel but raised in Vancouver. My accent is often mistaken for a Quebecoise accent, thanks to my mother’s influence. 5) One day, when I can travel somewhere else besides visiting my family in Israel & Montreal on a yearly basis - I would like to travel to: Japan, Grasse, Morocco, The Carnival in Rio and the Mardi Gras in New Orleans. 6) “When I grow up” I wanted to be any number of things – school teacher, veterinarian, judge, opera singer, architect, psychologist, and even wanted to open my own soap factory that will make only lemon-verbena soap. I think in the end I made the right choice. 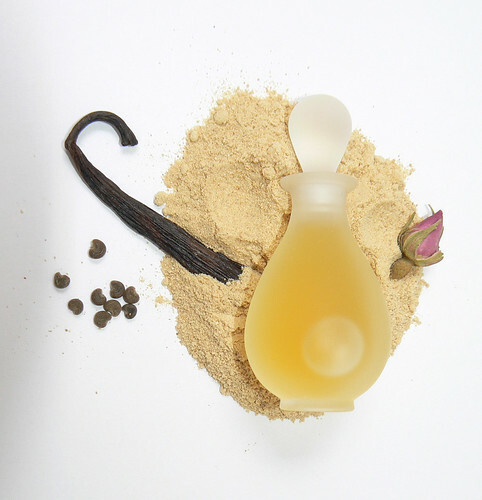 Aromaconnection - Marcia Elston's (Samara Botane) excellent blog covering many important topics such as ecological & cultural sustainability, safety & toxicity, rules & regulations in the aromatherapy/perfumery industry, and more. Gabriel's Aunt - Nikki Sherritt's (Gabriel's Aunt) candlemaking blog. Nikki makes the most amazing, all-natural and natural scented soywax candles and have created with me three candles already. I am not ashamed to take advantage of this game and give a little plugin for her work and her blog! Legerdenez -Caitlin Shortell's blog with many fascinating and very well-written perfume reviews. Moving and Shaking - Lou's excellent and beautifully illustrated blog, including some perfume reviews, but mostly just very, very fascinating topics. Perfume Shrine - Helg's visually and sensually senstive, well-written and informative perfume blog, including many perfume reviews, news and pop-culture references (i.e. : movies, fashion, commercial video clips, bottle & packaging etc.). Fall and Winter 2008/2009 holds many delicious surprises at Ayala Moriel Parfums! 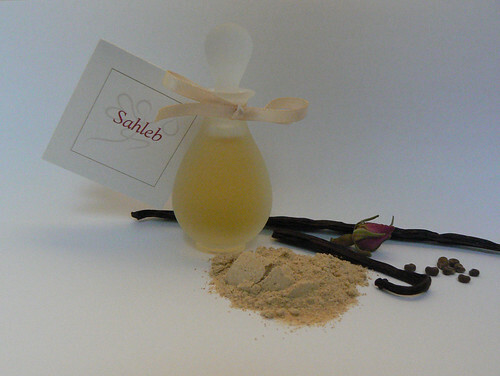 There is Sahleb, a smooth iris perfume inspired by the winter pudding-beverage in the Middle East; Roses et Chocolat Tea - yes, it's as good as it sounds if not better! - and two new candles to light those dark nights and add some fragrant spark to your home. Ayala Moriel is proud to introduce: Sahleb - the perfume version of a Middle Eastern winter favourite. 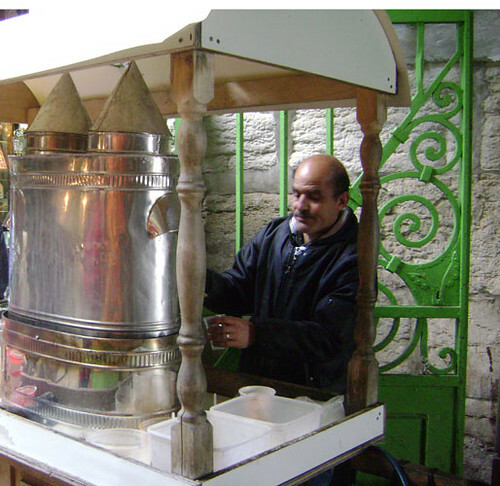 This scrumptious pudding beverage, flavoured with rosewater and crushed mastic resin is offered by street vendors straight from a copper caldron throughout the cooler seasons across the Middle East. Served warm and topped with coconut, pistachio and cardamom, Sahleb has become an essential part of winter and a way to make even the gloomiest street corners cozy and home-like. The creamiest orris root from Italy was used to create the smooth texture of this starchy and soothing pudding-beverage. A hint of the finest rose otto from Turkey, coconut and butter essence and crushed mastic resin complete the exotic flavour, and finished with a hint of vanilla and nutty ambrette seed Sahleb is ready to seduce you into winter! Sahleb is an exclusive and extremely limited edition – only 11 bottles were made, two of which are already taken! I hope that with your support we will be able to find and obtain more of that special orris butter to make more in the near future. We are almost sold out of samples (only 2 left). Each bottle of 9ml parfum extrait contains 20% orris butter with 15% irone (the molecule that makes it smell so creamy, dreamy and violet-like), retailing for $160. Available on AyalaMoriel.com and for limited time only also on b-glowing.com. Click here to read “Orchid, Pudding, Perfume” - behind the scents with Sahleb perfume. Update: We are completely sold out of samples for Sahleb, but still have 9 bottles in stock! Some of you were fortunate enough to have a sip of Roses et Chocolat tea with me at the Portobello West Art + Fashion Market in September. Now the tea is ready and packed in a cute tin and tied with a hot pink ribbon – the best gift you can give yourself this fall! Roses et Chocolat tea is made of two specialty black teas from China: Fu Hao, and Rose Congou, flavoured with organic damask rose, vanilla, anise, and, of course – chocolate! The chocolate flavour comes from real and pure organic cacao nibs – which are cracked cacao beans. They are sugar free and full of nutrients – and as Newport Yoga Blog notes, this tea is an excellent way to get your chocolate kick but without the side-kicks to badly influence you or your figure...! Roses et Chocolat is the 4th collaboration with Inner Alchemy Tea Co. - a Vancouver Based company that specializes in high-quality, wildcrafted and organic teas and herbs. For more information and serving suggestion, visit SmellyBlog. The past year at Ayala Moriel was dedicated to one secret mission: turning some of our most haunting perfumes into candles and teas! It all started with Bois d’Hiver last winter. Nikki Sherritt and I started working on the candle than, and took a little break in the summer to bring to you the citrusy sunshine of ArbitRary candle. So it wasn’t till NOW that we finally have what we wanted: a beautifully burning winter candle with a touch of fir absolute and orange blossom floral wax. Bois d’Hiver is everything the perfume is about – in a candle form. Imagine stepping into a cabin after a walk in the snowy forest – your hair is messy with fragrant coniferous needles and inside there is a warm spicy brew burning on the fireplace, and the room is filled with the scent of incense and myrrh yet with no smoke to burn your eyes. This is Bois d’Hiver – foresty, spicy and incensey in the best possible way. I was so excited to light it yesterday night, it filled an entire floor with a magical scent of outdoorsy coziness. Another candle that was in the making since the summer is White Potion – a tuberose-centred creamy white floral candle that is made of a combination of precious tuberose floral wax, ylang ylang, virgin coconut oil and tonka bean. To call it an aphrodisiac would be an understatement. Body + Soul Magazine's November 2008 issue features Gaucho perfume. You can click here to read Beauty Basics: Pure Perfumes by Courtney Humphries - or search for it in the glossy magazine that will be out on newsstands shortly before October runs out. As a gesture to our Body + Soul readers, with every order of Gaucho, you will receive a complemetary Gaucho Tea in our gift-wrapped 1oz tins (while quantities last). * Gaucho is the little rectangle green-juiced flacon on the very top left of the photo (the bottle looks different from the rest of my line). Habitat's beautiful new location in West Village in uptown Dallas, Texas. This upscale organic spa has a full range of beauty and relaxation services in two location (Plano and Dallas). The new Dallas location offers a unique all-natural and organic Scent-Bar, featuring five of Ayala's original natural perfumes: ArbitRary, Espionage, Finjan, Tamya & White Potion. In addition, you can also scent your home with our beautiful ArbitRary soywax candles and get treated with some Immortelle l'Amour perfumed tea while you shop. During the fall and winter, I invite you to join me at the studio for a series of inspiring workshops that will help you get ready for the holidays with unique hand-scented gifts and holiday menus and recipes. You will leave each workshop with gifts ready to go under the tree, that you have made yourself and smell wonderful! Can’t make it for your desired workshop on our calendar? - Contact us to book your own private workshop with a group of friends (up to 6 people). (778) 863-0806. We’ll do our best to accommodate your schedule and help you get ready for the holidays in a fun, relaxed & inspiring way! Workshops can be booked in advance online here. At least there is one known advantage for the cooler weather: the chocolate won’t melt! This is the time of year when chocolate truffles can be easily shipped across the country without getting spoiled. Pick your flavour and we will make a special batch for you of 40-50 truffles at a time of a flavour of your choice. These can be either served at your home or business for holiday parties or wrapped individually in gift boxes to pass on to special friends and colleagues. All flavours are sold for $60 a batch. Come celebrate the holiday season and light the first Hannukah candle with Ayala. Perfumed teas and truffles will served in abundance (naturally) as well as other aromatic and seasonal treats, including, of course – the infamous Sahleb pudding-drink! This party is a wonderful opportunity and a cozy environment for you to meet other local perfume lovers who shares your passion of natural perfumery, and experience our new line of candles, Sahleb perfume, and more. A Rose is a Rose is a Rose...Or Is It? 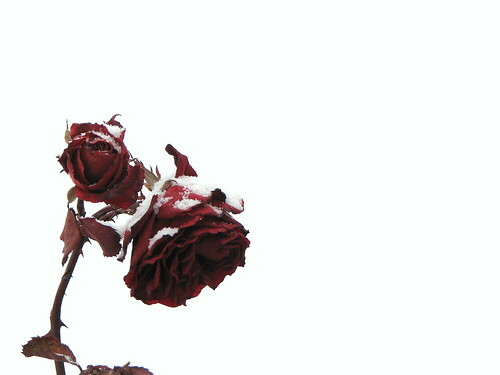 Winter Rose, originally uploaded by Deborah Harroun. I would really appreciate some help I am sure you are quite busy and received many emails; I am trying to decide between Nuit de Noël and Parfum Sacré . I seamed to be decided on Nuit de Noël ( I am a bit partial to it because I am born on Christmas Day and will travel home this winter to Transylvania and it seams to encompass a lit of all the things I miss and cherish) . After reading many reviews on both perfumes I am undecided between the two . My favorite perfume so far has been Amarige by Givenchy. Also I would like to purchase the perfume versus the EDT as it seams to be quite a difference in scents with Caron, is that so is there a big difference?. This will be my first Caron purchase . To tell you know a bit about my style and interests; I am not a girl loves all things pink king of gal:)... I love Marlene Dietrich and Greta Garbo and my biggest interest is ancient Greek and Roman history, I love all things classic and tailored. Thank you so much for your email and my apologies for taking so long to reply! Nuit de Noël and Parfum Sacré are very different from one another, albeit both being dark and rosy. Personally, Parfum Sacré reminds me more of Christmas than Nuit de Noël. There is something about it that just makes it feel very festive and at the same time - despite all the spices and musk - it feels very, very light. Almost like a caress of snowflakes on your cheeks, if those were warm; or a fuzzy fur collar. I have to say though that my impressions are based entirely on the eau de parfum formulation. I have never tried it in parfum, but I hear it is more peppery than the EDP. Nuit de Noël is darker and denser and if it has anything to do with Christmas, perhaps it is somewhat like plum pudding. There is a bit of an ink quality to it. It is also more dry than Parfum Sacré (even though the latter is dry and spicy and incensey). If there is any sweetness to it - it's more like licorice than a real sugary sweet. To summarize - while both perfumes are rosy and dark, Parfum Sacré is more airy, spicy and incensey, light and expansive while Nuit de Noël is darker, denser, deep and more mysterious. It is really about the effect you want to achieve and what you associate more with Christmas - something more contemplative (Nuit de Noël) or more festive and outgoing (Parfum Sacre). Both perfumes are excellent so it's definitely not a question of quality, but taste. Everything about the sense of smell fascinates us, from its power to evoke memories to its ability to change our moods and influence our behavior. Yet because it is the least understood of the senses, myths abound. For example, contrary to popular belief, the human nose is almost as sensitive as the noses of many animals, including dogs; blind people do not have enhanced powers of smell; and perfumers excel at their jobs not because they have superior noses, but because they have perfected the art of thinking about scents. Talk given by Avery Gilbert, Ph.D., author and smell scientist. The National Arts Club, 15 Gramercy Park South at 20th St.
Visit Business 24/7 to read about the re-opening of Grasse's infamous perfume museum, featuring artifacts from Ancient Egypt, Mesopotamia and, of course, France from as far back as Medieval times. "The chronological, interactive and olfactory – sense-driven – tour of perfumery is presented along three main fragrance themes: seduction, healing and communication". Sounds just like my cup of tea! "The collection's centrepiece is an 80-kilogramme "travel" vanity case once owned by Marie-Antoinette, the French queen arguably best remembered for her extravagant tastes. Fashioned out of mahogany and leather, the case is riddled with compartments and drawers containing brushes and gadgets necessary for the young queen's elaborate beauty regime". You can now smell strawberries while working on your favourite Origami design, thanks to this new strawberry scented origami paper. However, strawberry is not the only scent to premeate origami paper. There are Tampopo or herb-scented origami papers. And if you feel particularly inspired, try folding origami flowers on your own. You can even put a drop of floral absolute in the middle and make them smell real! Unknowingly, when buying an Onigiri "sandwich" for my daughter's lunch tomorrow, I got tempted to buy a rose-scented bubble gum. And also eat it, of course. My daguther was clever and through it right away. I felt obliged to keep chewing the thing, taking break from time to time. At first, the piece of gum resisted my biting and felt kind of chalky. Than it released a very mild rose scent and hardly any sweetness. And than it finally softened and opened up to my taste buds. From this point on, the gum had such an intensely artificial tea-rose aroma to it that I found it quite obnoxious but very curious. I had to take breaks in chewing it so I can smell other stuff and also just not smell the roses, for a change! It was not until later tonight, when I was searching for an image to include in a mundane "mental note" post (I'm too lazy to take a photo myself tonight) that I learned that the purpose of this gum was not to taste like roses but to make the chewer smell like one. For 6 hours...! b. Will be asleep when those 6 hours pass. I'm pretty sure I smell of roses now as I type this. Incidentally, this all happened after trying to drink Japanese plum bubble tea. Usually being quite a sour plum - the bubble tea was way too sweet and I was unable to finish it. My daughter's black sesame milky bubble tea was superb, however. The other important fragrances of the day were of course the three scented candles of my own line made for me by Garbriel's Aunt. But I'm too tired now and will report more tomorrow. Update: a day after chewing this bubblegum both of my entire legs got covered with red-rosy hives, and they are still there 3 days in. I haven't tried to smell them and see if they emit a rosy odour, but I'm guessing I'm allergic to geraniol when consumed in such large amounts. I'll stick to applying rose perfume on the outside of my skin rather than internally. Maybe people who are allergic to perfumes don't react that way when eating them, but I doubt it. All the same, an interesting novelty item - if consumed with caution! Far East Candle, originally uploaded by Ayala Moriel. 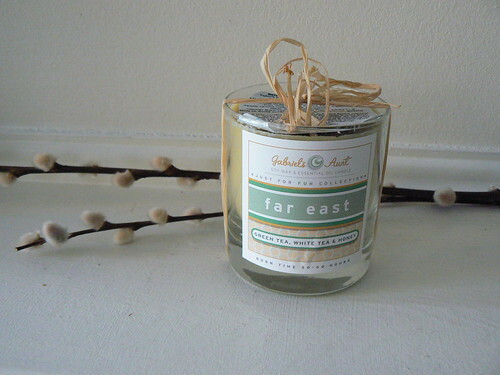 This week clearly has the mark of tea - beginning with the High-Tea on Sunday and continuing on to today, where I am lighting Gabriel's Aunt new Far East Candle, scented with white tea, green tea and honey. Just like a cup of green tea, this candle is subtle and gentle and probably "hard to get" at first. But once you get it - you're hooked to the serenity of a more neutral home scent that is not overpowering. The glass container can be recycled as well - visit Gabriel's Aunt for ideas and tips as well as her recycling program. 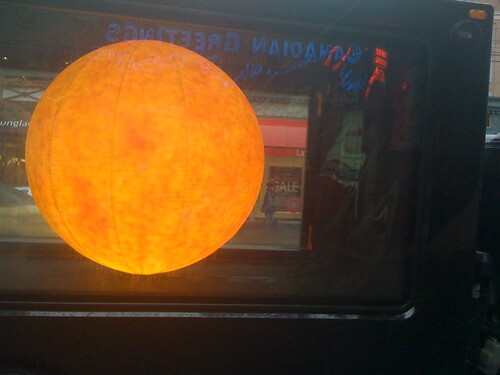 Sun & Scent of Outer Space, originally uploaded by Ayala Moriel. Apparently, outer space has a scent...! "We have a few clues as to what space smells like. First of all, there were interviews with astronauts that we were given, when they had been outside and then returned to the space station and were de-suiting and taking off their helmets - they all reported quite particular odours. For them, what comes across is a smell of fried steak, hot metal and even welding a motorbike, one of them said." “We have already produced the smell of fried steak, but hot metal is proving more difficult (...) We think it’s a high-energy vibration in the molecule.” (Chemist Steven Pearce interview to The Times). Thanks to Siobhan for the tip! 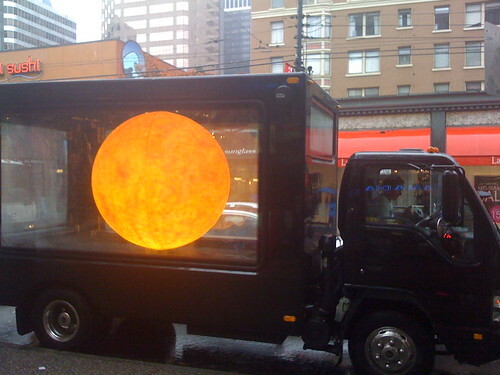 Sun in Motion , originally uploaded by Ayala Moriel. The highlight of my weekend is most definitely the High-Tea organized by the two lovely high tea girls, Mojgan and Heather. I was wearing Espionage (my original, costus-based formula) ad sipping a blend of earl gray and lapsang suchong. Smoky and delicious, and quite Halloween-worthy. The menu included a wide variety of teas, including my newest Roses et Chocolat, and the traditional 3-tiered tea tray, with delicious homemade treats such as pear tarts with rosemary & orange scented walnuts, sandwiches with tapanade & goatcheese, pineapple-banana-coconut loaf, snowflake naans, lemon tarts, chocolates by RuBEN, and really delicious homemade kiwi jam and carrot jam. Sahleb, originally uploaded by Ayala Moriel. A flower and a dessert… Sahleb is the stuff dreams are made of. Flavoured with rosewater and crushed mastic resin, Sahleb (orchid in Arabic) emerges from every street corner in steaming copper caldrons. The creamiest orris root is the core of this buttery-smooth perfume; complete with rosewater, vanilla and butter and topped with coconut, cardamom, mastic and nutty ambrette – Sahleb is ready to seduce you into winter. Ayala Moriel is proud to introduce Sahleb: the perfume version of a Middle Eastern winter favourite. This scrumptious pudding beverage, flavoured with rosewater and crushed mastic resin is offered by street vendors straight from a copper caldron throughout the cooler seasons across the Middle East. Served warm and topped with coconut, pistachio and cardamom, Sahleb has become an essential part of winter and a way to make even the gloomiest street corners cozy and home-like. Sahleb Orchid, originally uploaded by Ayala Moriel. Sahleb perfume was born from three simple elements: Beurre d’Iris, butter essence the obscure and comforting pudding-beverage. It was meant to be a simple comfort scent, with no particular baggage or deep history. The name of the beverage suggests its origin: Sahleb is in Arabic word for orchid (Sachlav in Hebrew). 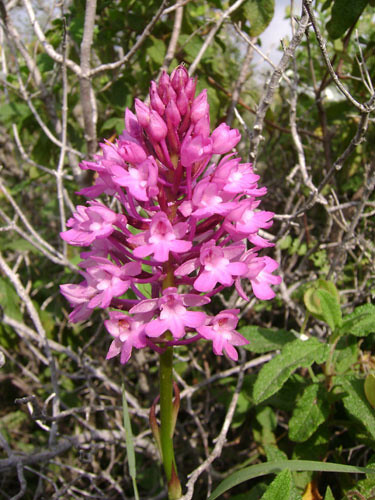 And indeed, Sahleb is made of the ground starchy bulb of a Mediterranean species of orchids: Early Red Orchid (Orchis mascula). Several orris butters have passed by my nose in my last 8 years of perfumery. But no orris root really fascinated and excited me as much as a particular batch I received from Eden Botanical: Beurre d’Iris (aka orris butter -which really is the essential oil, but with a consistency of crumbly butter or powdery wax). It come stright from Florence, Italy, where the Iris pallida grows, and is the most creamy, smooth and sweet orris I’ve ever encountered. Warm rather than the cool and vague, distant powderiness that most orris butter present. Orris butter is one of the most precious perfumery materials, currently set at nearly $7,000 per pound. There is much labour involved in the process: the roots need to be washed and peeled by hand and than mature for several years in dark cellars. They are than pulverized before being distilled into an essential oil. Lastly, the yield is relatively low which makes it prohibitive; yet at the same time, the presence of irone, a violet-like molecule similar in its aroma to ionone, makes it invaluable in perfumery. The particular orris butter in question had 15% irone, which is almost the highest irone content one can hope for (sometimes, 20% irone is available). The butter CO2 is a molecular distillation of this beloved dairy product. If you ever fry your eggs with a bit of butter, or make homebaked crumbly butter cookies or pie crusts - this is the scent of butter CO2. When I first smelled it I was simultaneously repulsed and intrigued by how realistic and potent it was. It simply hits your nose with this burnt-butter sensation, suffocating and comforting at once. Just like a late, fat Sunday brunch. Sahleb Merchant, originally uploaded by Ayala Moriel. My constant inspiration comes from home, where I grew up in the Middle East, surrounded by an abundance of flavours and fragrances native to my country. Living in Vancouver most of the year, I miss all of the plants and smells and little edible pleasures of daily life. Especially on days when I go to my neighborhood Middle Eastern deli and there is no sahleb on the shelf (or worse: no tahini! But that’s because my brother probably ate all of the tahini supply in the city in his 12 months stay in Vancouver). On days like this a perfume can help bridge over the physical distance and give the illusion of closeness, and the comfortable certainty of nostalgia. For those of you who haven’t been fortunate enough to try sahleb (yet), you must know that it is the most comforting beverage you can imagine, and at the same time exotic and intriguing. It is made of ground starchy orchid root powder, cooked with milk and a bit of sugar and rosewater (sometimes ground mastic resin is added too). It is served warm and topped with crushed pistachios, coconut and spice (most typically cardamom and cinnamon). In Café Clil in my home village, it is served with a split banana and some peanuts on the side as well, which is original, different yet appropriate. Sahleb Ingredients, originally uploaded by Ayala Moriel. Somehow, it all came together in my mind and I was determined to make a perfume inspired by Sahleb. Sahleb required subtleness and richness and had to be very milky and starchy. So it was only natural that I would use the obviously milky butter essence, and the haunting orris butter with 15% irone. And that how Sahleb was born. Ambrette seed was crucial for the composition’s fatty quality and also to make it more perfumey and skin-like. There is only very little rose in the perfume, as well as a bit of mastic resin tincture which I had to prepare myself. The spices and top notes used also have some starchy quality to them – coriander and rosewood. Unfortunately, when I was ready to launch Sahleb this season, I learned that my supplier have run out of the orris and were not able to anticipate when this quality iris will be back in stock. I have a feeling that the wave of iris scents that washed us throughout last year (i.e. : Iris Ganache, Infusion d’Iris…) have used up a large portion of the world’s supplies and I am now in a bit of a panic regarding finding quality orris butter for my perfumes. Therefore, I have decided to launch Sahleb as an exclusive limited edition, which means with a price point ($160) that truly reflects it’s cost, and in very limited run of only 11 bottles (2 of which were already taken). Also, there are no samples offered for Sahleb perfume - aside from samples that I have given out before I knew of this little “orris crisis”, and 5 more that are in stock there will be no samples available. What To Wear on Elections Day? It’s Elections Day in Canada, and while some Canadians are having hard time deciding between this political parties and candidates to represent their district; others are faced with far more important and ilfe-changing decisions that can affect great issues such as the environment, health, beauty, mood and self-esteem: what perfume to wear today? As the name implies, wear something that is classic and tame, continuing the party’s traditions from the early 1950’s. At the same time, this gives you the freedom to wear perfumes with rare animal ingredients. The most traditional being castoreum from local Canadian beavers who’ve been slaughtered and skinned in the process, giving the Crown a lot of gold. Stick to perfumes with uncontroversial names such as Knize Ten or dab of Shalimar perfume and stay away from Cuir de Russie. No. 5 is another classic exploiting the civet cat this time and best worn with a suit and a set of gigantic false freshwater pearls bought from the tourist stores on Robsonstrasse. If you don’t have one yet, pick one up on the way to the polls. This one was the toughest to pair perfumes with. In fact, I’m still not convinced I have it right yet. All I could come up with is something to do with their proposed carbon tax. So I researched a little and very quickly learned that there is a perfume called Carbon, which I know nothing about, and also one from Weil called Carbonique. I was disappointed there is no perfume with the word CO2 in it, but I’m sure someone clever will eventually do it. The Canadian Liberal Party also really thinks of itself as a leader, so maybe First by Van Cleef & Arpels is a good choice. Alternatively, you may smother every other voters at the polls with a fragrance that most resembles the Liberal party’s leader last name – Celine Dion. Whatever it is that you’re wearing, make sure it’s cheap. It just doesn’t make sense to be spending money on perfume when you can spend it on so many more important things such as Pharmacare, affordable housing, ensuring fair wages for the blue collar workers, etc. Stick to drugstore fragrances and anything on clearance. Or just wear Democracy. I’ll put it on clearance just for you! If you are just in a transition into green life, wear Vent Vert or anyting else from the green family. If you are already well into it, wear an aromatherapy perfume from Whole Foods, Utopia by Rich Hippe or get their own organic custom made perfume from one of the indie natural perfumers (depending on what you can afford, of course). with buttons, bags, T-shirts and other useful items. Too bad they overlooked a green organic perfume for the party, preferably packaged in empty, wildcrafted acorn shells. If you don’t have a clue what they stand for that’s ok, I didn't even know they exist until today. Apparently, they are really big on property rights, personal responsibility and liberty. Therefore, I would recommend you make sure whatever perfume it is you are wearing is actually YOURS. To be sure of it, you might as well just blend it yourself, right? Alternatively, you may go with Mon Parfum (Palom Picasso), Ma Griffe (Carven), My Sin (Lanvin), or Just Me (Paris Hilton). This is where wearing Cuir de Russie might actually be okay. At the same time, you might be confused for a conservative – a great way to fool them all while promoting the Revolution! Alternatively, wear something red: Red Door, Red Delicious, Red Jeans or anything that has the word “Red” in it really. For the more burguoise supporters, look up anything that mentions “Rouge”: Habit Rouge, l'Herbe Rouge, Geisha Rouge, Chypre Rouge, etc.… And if you want to be less literal how about one of those avant-guard scents from the Commes de Garcons Red Series? And lastly, of course I don’t care what you vote for and am not by any means trying to influence your decision - I just thought just make sure you wear the right perfume today ;) And of course I couldn't resist the opportunity to inject some humour into this blog. So I hope this will be taken as lightly as it was intended. At the same time, I hope that the American voters are going to be able to take some of those ideas and implement fragrant voting when the critical day arrives in the USA. Oh, and by the way, unlike Americans, who need to register to vote well ahead, Canadians are fortunate as they can excercise their democratic right on the spur-of-the-moment (as long as you make it to the correct polling place): if you are a Canadian citizen, you may register to vote AND vote at the same time, right-on-the-spot at the polls, as long as you have your proper ID’s and proof or residence (i.e. : utility bills addressed to you). Pretty easy, really. venice - square version, originally uploaded by Pay No Mind. Happy Sukkot and Happy (Canadian) Thanksgiving! Lots of reasons to celebrate today and lots of things to be thankful for. Visit Newport Yoga blog to read Mojgan Fay's infatuation with Roses et Chocolat perfumed tea. 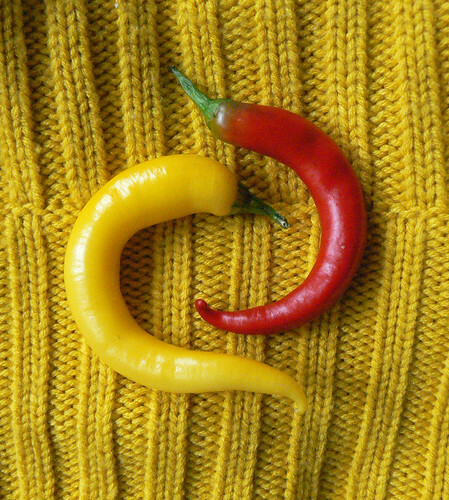 Chilli Sweater, originally uploaded by Ayala Moriel. Here’s hoping those of you who fasted on Yom Kippur have had an easy fasting and that you are all going to be inscribed in the book of life and have a good year of health, peace and truth. The fast of Yom Kippur in my family has two mythical endings: a hand-picked guava from the nearby tree (a tradition that started with my stepfather’s grandfather, whose eyes filled with tears of joy every time he was about to eat a fruit grown on the holy land), or rushing home from the synagogue to the infamous cilantro-centered Harira soup. In both instances, very aromatic ending to a bland day of fasting with neither food nor water. A bit extreme, especially considering that both guavas and cilantro are quite controversial aromas which usually garner polarized reactions. With this little piece of family history, I’d like to share with you three cilantro-centered recipes; two of which I mostly owe to my stepfather, blessed be his soul, as one is his own very invention and the other was inherited from my Moroccan side of the family. Lastly, there is a recipe for the Yemanite hot-pepper condiment Zehug which I adopted from my friend Einat. - Wash the cilantro and dispose of any brown or old leaves. - Especially good accompaniment to avocado sandwiches and various winter soups. Harira is the national soup of Morrocco and used both by Jews and Muslims to break the fast (of Yom Kippur and Ramadan, respectively). It is my guess that the Jewish Harira is very simple to prepare, because lighting fire and cooking is forbidden during that holy day. The legumes are soaked since the even of Yom Kippur, prepping them for a relatively short cooking time when everyone arrives from the synagogue. It is simply flavoured with cilantro an coriander (and cumin if desired), keeping it simple and comforting. If you are in a real hurry you could even skip the sautéed onion part and go straight to cooking the chickpeas and lentils. Please note that both spices are best when freshly ground, preferably in your mortar and pestle. The other alternative is using a coffee grinder. - Rinse the lentils and garbanzo beans. - Cover the garbanzo beans in water and boil. - Skim off any foam that forms on the top. - Cover the pot with the lid and wait while preparing the rest of the ingredients. - Sautee the onion in olive oil until golden-brown. - Add the garlic and Harissa and sautee for one more minute. - Add the soaked and rinsed lentils and cover with boiling water. - Cook until the lentil soften, than add the garbanzo beans. - Add spices to taste. - Add the cilantro and continue cooking until the lentils and garbanzo beans have softened and the soup has reached a smooth but not too thick consistency. - Serve with lemon juice. Zehug is a a Yemanite condiment that is used on breads, as a dip, and to flavour soups and stews. It is especially good with bread, either as a substitute for butter, and avocado in particular. I met my friend Einat in the West End Farmer’s Market a couple of weekends ago while she was stocking up on hot peppers, and the first thing that went through my mind was Zehug. I started collecting hot peppers too and than we both found ourselves having a conversation about Zehug. The following is loosely the recipe she gave me which turned out simple and great. The key is to use the freshest most flavourful ingredients and grind your spices freshly using a mortar and pestle. - Cut off the stems of the hot peppers and slice or chop them. Be sure to use gloves for your hands to avoid burning your skin and eyes throughout the day. - Using a food processor or a hand-blender, work the mixture of peppers, garlic and cilantro into a paste. Add a bit of olive oil to make the job a little easier. - Alternatively, if you have sliced your peppers thinly enough, you will be able to make the Zehug using mortar and pestle (and trust me, the flavour and texture would be significantly better). - Add the spices and adjust to taste. - Place in a jar and cover with olive oil. Use within 1 week. Today I've been wearing Roses et Chocolat. I haven't worn this for quite sometime - except when trying the tea with Dawna last week. I have to say, this perfume matured into something much lovelier than it even was in its youth. After a couple years of maturing (this is how old the sample I have is) it has morphed into a very perfumey rose that reminds me of Russian rose incense (it comes in mica dusted pellets). Only that the Russian rose incense smells very synthetic and Roses et Chocolat is purely natural and rosey and complex like a real rose should be. The amber and pink pepper added to the rose and cacao account for that incensey surprise. And last but not least: we are now fully stocked up on ArbitRary candles and the soothing and seductive Roses et Chocolat tea. You better get yours soon, because both are as popular as they deserve to be. Just FYI: my personal 2oz tin of Roses et Chocolat tea is halfway empty within the course of 10 days. My guests here at the studio love it too. Dan za paprike tj. Tamara pomaze Petru, originally uploaded by DuchessTara. 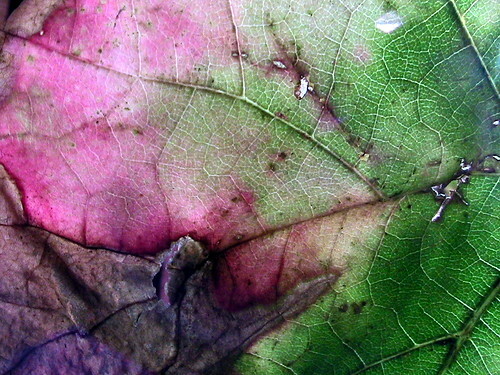 Autumn is a time of transition between abundance and light to restriction and darkness. The change in light and warmth sets at atmosphere of contemplation. A sense of wanting to find the essence of life and a place where one can feel content or safe before entering this darker phase. If life does pass before one's eyes before death, than this is perhaps like a little death, where I examine my mundane routines and how they represent my view on life and reflect bigger truths. 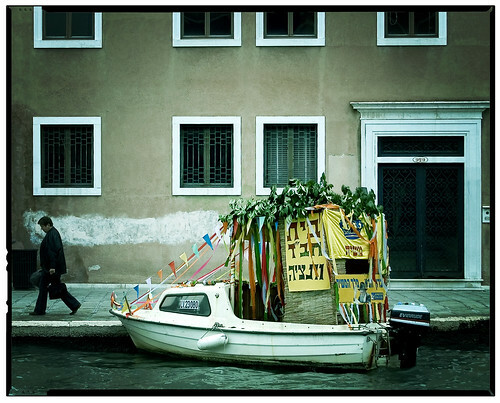 As the previous year dies (the Jewish one, of course), a new year emerges, with possibilities of the unknown. For a blog about perfume, this is the time of year where I would typically come up with a list of perfumes I like to wear this season or just general ideas. Although I like making lists (as I already mentioned many times before), I would like to include here a few other lists that are perhaps more serious and have more to do with the future of my little perfumery, this blog, my art and life. This will also give you a glimpse into what have been brewing in my many cauldrons this summer. Despite the fact that the market is over-flooded with new fragrances on an average of more than one-per-day, every season I get requests from old and new customers alike asking me what's my newest fragrance and if there is anything new brewing for the new season. With 47 existing fragrances (not including any discontinued perfumes), I honestly don't think I need to come up with a new fragrance. There is so much to choose from as it is that really want is for people to feel encouraged to find a true love among my existing collection. As far as "news" go, I have decided to focus more on expansion of the collection horizontally rather than vertically, meaning: develop new and innovative products that will carry the existing fragrances. This allows for new and exciting collaborations with other like minded artisans, while offering new and exciting ways in which fragrance can be enjoyed: in a tea, in a candle or in a sachet. At the same time, to satisfy my ever olfactory-starved fans, I am going to release exclusive limited editions of perfumes that are truly unusual and in many cases made of rare materials that I may not be able to re-stock on or that are simply so cost prohibitive that I can only afford to have very little in my organ and produce only limited quantity of the perfume. You could read more about that below and also as the fall exclusive get released (SmellyBlog would be the first one to know, promise!). Two new candles are in the making as we speak, another joint collaboration with Gabriel's Aunt. I tired hard to keep it a surprise till now what are the exact scents but I can't keep the secret any longer: the first is White Potion - tuberose in a candle form (thanks to the existence of tuberose floral wax this is made slightly closer to the price range of an "affordable" candle). The other is Bois d'Hiver, which Nikki and I have been working on over a year to perfect and really wish my dream will finally come true this winter and I could bring the forest back home with my very own candle. This winter, I am finally releasing the much-talked-about Sahleb, a buttery orris perfume inspired by the Middle Eastern beverage of that name. Sahleb is a cozy warm pudding drink sprinkled with rosewater, pistachio and cardamom that is served only at winter time. It is made of the starchy rhizomes of the Early Red Orchid. It is just delicious. The reason Sahleb is launched as an exclusive limited edition is because unfortunately I'm nearly out of the key ingnredient in it, a very high quality Florentine orris butter with 15% irone, with a creaminess that I have never encountered in any other orris butter, and cannot for the life of me restock it. I have only 100ml of this precious perfume, and for all I know that's all I'm going to have for a while. So 11 bottles is all I'm going to have for now and there will be absolutely no samples. Re-working my display at Portobello West so that the new products are featured yet without taking away from the perfume-focus of my company. I really need to make my display more 3-D and I am picking my brains trying to figure out how to do it without needing to carry too much to the market and still have a simple and clean display. The days of wearing Le Parfum de Therese and Un Jardin Apres la Mousson day after day after day are over pretty much since I got off the airplane at YVR. Now I'm mostly getting back into Chypres again, a fragrance family that I have neglected for nearly a year. Last year, if you can recall, I haven't had a single Chypre on my fall list, even though it's the classic season for this family. Ayalitta - my newly re-found love which I have neglected for so long. Perfume, like faithful dogs, may be sad when you are gone but don't show it when you are back. I was wearing the solid mostly, and thinking to myself after 12 hours of wearing and still going strong: "hmm, perhaps I should only make Chypres from now on and this way no one will ever be able to say my perfumes don't last long". A few days ago I posted about the promise of Roses et Chocolat tea for Sunday. Well, it did come true and even exceeded my expectations of how wildly beautiful it will be. The pleasure of sipping a roses and chocolate perfumed tea was heightened with the visual, tactile and flavourful presentation Dawna has welcomed me with yesterday, for our official perfumed tea launching ceremony. We always get together for a private little tea party when I pick up the tea, so that I can have the full experience of what Dawna has intended it to be. Roses et Chocolat perfumed tea is our first black tea in the perfumed tea series, and Dawna has selected Fu Hao and Rose Congou black teas (both from China) for their rich, dark, almost-chocolatey qualities. The tea gives an earthy-floral backdrop to the sensational marriage of cacao and rose petals - both organically grown and very fragrant. 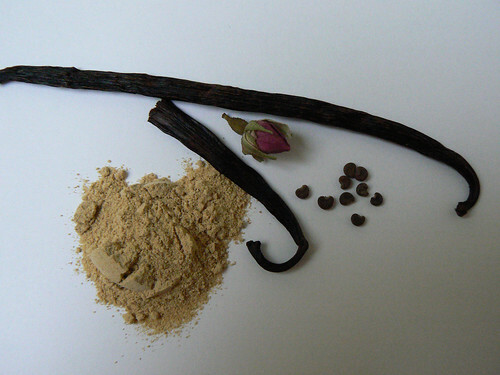 A touch of aniseed gives a hint of spiciness without really ever being noticeable or recognizable as aniseed; and finally there is vanilla bean, which Dawna says was the one ingredient that really made it all come together. Much like the amber accord in my Roses et Chocolat, which prevents it from being muddy, heavy and dense. The chocolate notes are rich and earthy, and the rose petals are fruity and complex, so beautiful it's hard to believe they are dry and not fresh. Although this is the kind of tea that lends itself well to milk-and-sugar (Royal Milk anyone??? ), I find it best served as is, dark and unsweetend. If sweetness is desired, a square of chocolate might be a good balance or Rahat Loukum (and if you cannot get beyond the stickiness of this candy, try the rose pastilles, which are the little white balls pictured above). I most enjoyed it witht he dark chocolate - a 67% from Thomas Haas in North Vancouver - described by it's maker as floral, and by myself and simply fabulous - not too bitter and creamy without the overwhelming-sweetness of milk chocolate). Alternatively, serve it with rosewater-flavoured semolina cake (aka Harissa or Basboosa), which is what I did for dessert in my Rosh HaShana dinner, and it was fabulous. Temper your tea pot (by rinsing it with boiling water). Steep 1 teaspoon of tea blend for every cup of tea - between 2-3 minutes depending on how dark you like your tea. Serve hot, accompanied by dark chocolate or rosewater flavoured sweets (i.e. : semolina cake, baklawa, rahat loukum, rose pastilles). Can be also served with milk and/or sugar if desired (in which case we recommend steeping for 3 minutes). Basboosa is a Middle Eastern semolina cake, sweetened with a rosewater honey syrup and often including almonds in the batter or just for decoration. Inspired by the incredible basboosa I had in ancient Jerusalem a couple of springs ago, I have modified a recipe I found online, using goat's milk yoghurt instead of the usual cow's milk yoghurt/buttermilk that the recipes usually call for. - Boil in a small saucepan until all the sugar has melted and the thin syrup can stick to a table spoon. - Take out of the oven, and immediately sprinkle over the syrup over the hot cake, until the cake is all soaked in syrup. Serve warm or in room temperature. Makes a great accompaniment for dark Turkish coffee or to Ayala Moriel's Roses et Chocolat perfumed tea.